Change Your Words, Change Your World! Admit it, you talk to yourself. Whether you speak the words out loud or think them in your mind, you are always talking to yourself… about yourself. The important question: what are you saying?Much of what we say is negative, hurtful and damaging, setting us up for failure. 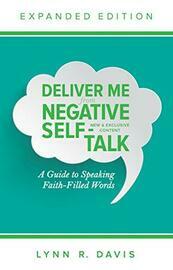 If you want to live the victorious, abundant life God has for you, start by changing what you say to yourself. This has the power to radically transform everything!In her relatable, down-to-earth style, Lynn Davis offers scriptural self care for the soul in need of encouragement.Learn how changing your self talk will help you:• Experience victory over fear, bad habits and addictions• Overcome negative emotions• Think God’s thoughts about yourself by changing your meditation• Receive healing from sickness• Increase your self-esteem• Make declarations that strengthen your faith. Get delivered from negative self talk today and begin speaking powerful, faith-filled words that unleash God’s purpose, joy, and healing in your life!